Ya can’t have a birthday without some rainbow sprinkles! These Funfetti French Macarons are THE perfect treat to celebrate Desserts With Benefits turning 7! If you’ve read My Story, then you know when and why I started blogging. Long story short, I was a freshman in college looking for a way to procrastinate studying from finals (why yes, I am a professional procrastinator, thank you very much). After finishing my first year as a Nutritional Sciences major, I realized I didn’t want to become a dietician. 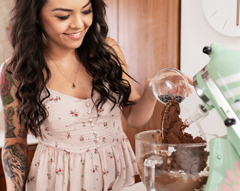 I wasn’t exactly sure what I wanted to do after I graduated, all I knew was that I love food, love nutrition, and love helping people bring dessert back into their lives — the healthy way! After two years of blogging as an outlet for school stress (by the way, I still hate you chemistry and o-chem), my blog really started to take off. This is when I finally realized what I wanted to do after graduating. I wanted to become a full-time blogger! It took a while longer than I expected, but as of January 2017, I achieved that goal! This might sound crazy, but this blog has turned my life right side up. You have no idea. I am truly grateful for you. YOU are the reason I am lucky enough to do what I love for a living. This blog has given me strength, direction, hope, and a future. There was a time in my life when I thought you had to give up sweets in order to be healthy. That was probably the most depressing time of my life. Before I started blogging, I was completely lost. I’m not gonna lie, I had zero drive, zero passion, zero ambition… I didn’t take school seriously. I didn’t want to go to college (I only applied because I felt pressured by my parents). As it turns out, moving across the country to a state I’d never step foot in before to attend school, away from my friends and family, was the reason this blog came to be. These past seven years have had its bumps and hurdles, but I wouldn’t change any of it even if I could. Despite the hiccups, blogging has made me brand new. So thank you! Thank you all!! I can’t tell you how many lovely emails, comments, and direct messages readers send me on a daily basis. I’ve received hundreds of reader testimonials saying my recipes have changed their lives for the better — whether that’s weight loss, more balanced eating, indulging in dessert without feeling guilty, etc. Even when I’m down in the dumps and share some of my personal struggles with you, you’re always there to provide support, encouragement, and wise words. You’re there to remind me that I’m a business owner, my own boss, a trademark holder, university graduate, and cookbook author… like, WHAT?!? What the heck happened??? At age seventeen, I literally sat on the couch watching TV all day. At age twenty-five, I work daily (and funny enough, I don’t even own a TV anymore). What happened? FOOD happened. My love for dessert, passion for nutrition, and affinity for combining the two sparked something inside me to create this blog. Your constant positive vibes and love for healthy treats are what keeps me and this blog going! I have poured every ounce of my being, my heart, and my soul, into this blog (and its 600+ recipes!) over the last seven years. Because people who give their food, give their heart. Desserts With Benefits is a happy medium that connects me to you, and you to me. 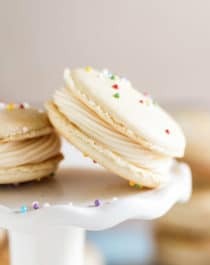 These bakery-worthy Funfetti French Macarons are adorable, bite-sized, sweet perfection! You'd never know they're all natural, low fat, gluten free, and dairy free too. No need for the bleached white sugar, artificial flavorings, or artificial food dyes. Line 3 cookie sheets with silicone baking mats or parchment paper. Prepare a piping bag with round tip (#804). In a small bowl, add the powdered evaporated cane juice and almond meal. Set aside. In an electric stand mixer bowl fitted with a whisk attachment, add the egg whites and salt. Turn the stand mixer on high speed and start a timer. Slowly sprinkle in the 50g of evaporated cane juice. Whip this mixture for 5 minutes. Mixture should form stiff peaks. Slowly add the vanilla paste and almond extract and whip for 2 more minutes. Sift the dry ingredients into the stand mixer. Fold the batter by hand with a silicone spatula until everything is fully incorporated. Do not under mix and do not over mix! Mixture should be in between “plopping” off the spatula and “flowing” like a thick ribbon. Scoop the batter into the prepared piping bag and pipe 1” buttons onto the prepared cookie sheets, each about 2” apart. Tap the pans on the counter HARD a few times to deflate any air pockets. Sprinkle on the rainbow nonpareils. Preheat the oven to 350 degrees Fahrenheit. Let the piped macarons sit at room temperature for ~1 hour. Shells should form on the surface of the macarons (when you can tap the surface, they shouldn’t stick to your finger at all). Bake one tray at a time for ~8 minutes, or until the fluffy “feet” form and the surfaces of the macarons are dry and turn a VERY light golden brown (they go from perfect to an unappealing tan in less than a minute, so keep those eyes peeled!). Let cool completely on the cookie sheets. Pipe your frosting of choice (Cream Cheese Frosting is delicious!) onto half of the macaron shells, then sandwich the remaining shells on top. Serve immediately. **Such as a Vitamix or NutriBullet. This recipe makes 56 macaron shells. You'll be able to make 28 macarons total. You know that magical land where all of your wildest dreams come true? Yeah, that land is over at my place. These Funfetti French Macarons are the literal equivalent of magical-unicorns-flying-over-cotton-candy-clouds-raining-gummy-bears-directly-into-your-pie-hole. These bakery-worthy Funfetti French Macarons are adorable, bite-sized, sweet perfection! You’d never know they’re all natural, low fat, gluten free, and dairy free too. No need for the bleached white sugar, artificial flavorings, or artificial food dyes. And now you can! Use a high-speed blender like a Vitamix to make homemade powdered sugar from unbleached, organic sugar (or “evaporated cane juice“). I’ve made my own powdered sugar for years now, and every batch of macarons I make with it is a success! 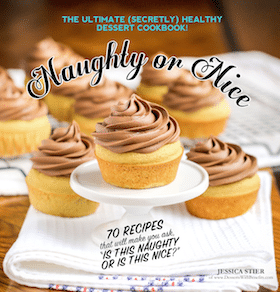 Desserts With Benefits 7th Blogiversary Giveaway: Win a Vitamix! Happiest Blogiversary to this AMAZING, INSPIRING, and AWESOME blog! And to you, dear friend! I love supporting a strong, badass woman in the pursuit of her dreams and you’ve definitely proven that you have the guts and the strength to follow those dreams of running a successful food blog and brand. Oh my goodness I can’t believe the blog is turning 7!! I’ve been following you and your blogging journey for at least 4-5 years and have so enjoyed watching you grow! I can’t wait to see where you take the blog next! This is perfect! I was wanting to make something for my best friends mom surprise retirement/you’re cancer free(again) party this weekend and this will be perfect! Happy birthday!! I’ve enjoyed your blog for years, what a treat (pun intended) to watch you grow. Macarons have always been my baking fear… Still waiting on that successful batch (maybe funfetti)! Hooray for SEVEN YEARS! Look at you now! Congrats on all you’ve accomplished and I can’t wait to see what yummy recipes you create in the future. And these macarons are beautiful! I would make a yummy green smoothie! And happy birthday to your blog! Happy birthday!!! I would make a delicious smoothie! I think I would make a batch of green smoothie waffles – for some reason if I use veggies to turn things like waffles or muffins green my kids actually get excited to eat them, but if I just give them a green smoothie there are scrunched up faces and upturned noses. Happy 7TH Blogiversary! I have tried to make Macarons once and they didn’t come out! I refuse to give up so Funfetti French Macarons that are gluten free is defiantly a must make in my book!! If I won a blender I would make some homemade coconut yogurt! Happy happy birthday! I love your blog and have been reading it for years. Everything you make is so beautiful and well thought out! Congrats on 7 years!! If I won the blender, I would make a nut butter or your date caramel. Thanks always for great recipes, beautiful photos, and creative ideas! If I won the Vitamix, I would first probably whip up a fun nut butter or dessert hummus. Thanks again! I’d make different flavor nut butters of various nut + seed combos! I would make smoother smoothies! i would make a green smoothie!! If I won the blender, I’d make Spring Pea Soup with it. I’d definitely make nut butter and smoothies with it~! Smoothies! Always best with a high speed blender. Happy birthday, blog!! I would make a green smoothie! Happy Blogiversary!!! I’d first make a frappe, because like you, ice cream is also the road to my heart. Happy blogiversary! 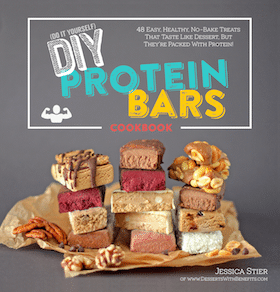 Hummus and healthy protein ice cream! I really need a high-powered blender. This would be amazing! I love your blog! It’s a game changer for me as I’ve learned so much! Thank you for this amazing site, I can’t wait to try these if I can get the powder right! The first thing I would make is chocolate ice cream! If I won I would make a strawberry banana smoothie first! Congrats on your blogiversary! The first thing I would make with this blender is some chocolate PB nice cream (frozen bananas)! I really love making healthy smoothies and so do my kids! That’d be the first thing we’d make! If I won the blender I would make hummus. Grats! I’d make some milkshakes first. If I won this blender I would make CUPCAKES!!! Peanut butter and chocolate…yumm! I would make a smoothie with strawberries, kiwi, bananas and cranberry juice. I would make a tomato soup. Happy Blogiversary! I’d make a banana strawberry smoothie first. But then I’d go wild and make tons of stuff! I love making pretty smoothie bowls. I have always wanted a Vitamix. This would be a dream come true! I make smoothies almost every day, this would be awesome! I would make a green smoothie! Congratulations !Hope you and your Blog have a “Smoothie” future! I would make the perfect hollandaise sauce! If I won, the first thing I’d make would be snow cones!!! My daughter is bonkers for them!